Sam Houston Park is a proud oasis of living history and wide-open greenness amid modern monuments to corporate and civic institutions. Surrounded by the skyscrapers and freeways that typify Twenty-first Century urban life, a short walk from City Hall, it reminds us all to breathe in fresh air and remember the gentility and nobility of the lives lived by those who built our great city and improved it through their efforts. Mayor Sam Brashear appointed Houston's first park committee to oversee the establishment of a city park in 1899. The 20 acres chosen came to be called Sam Houston Park. It was landscaped into a Victorian wonderland, with footpaths laid out to pass by an old mill and cross a rustic bridge over a pleasant stream. The park also included a 52-year old house that had long been used as a school. By the 1950's, Houston was a much different city, and boom times meant that many fine old buildings from more genteel eras were being demolished to make way for a new modernity and burgeoning commercial affluence. The threat to demolish the old house in Sam Houston Park, now over a century old, brought together a group of Houstonians dedicated to saving tangible connections to the vanishing past. Led by Faith Bybee, Harvin Moore, and Marie Phelps, the Heritage Society was founded in 1954. Their efforts to save the Kellum-Noble House were successful, and the Society turned to other historical preservation projects. The result is a treasure for our city, a group of buildings set in Sam Houston Park and faithfully restored as a historical park. 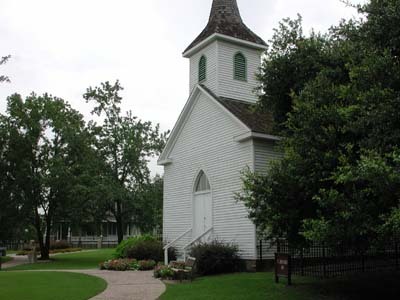 The buildings are representative of many eras, from a pre-Texas revolution cabin to an 1891 church built by German and Swiss immigrants to a mansion built with all the conveniences available in 1905. The homes show us how diverse segments of society lived daily, from freed slaves building new lives for themselves to prosperous merchant families. Guided tours of the restored buildings are available from the Heritage Society. 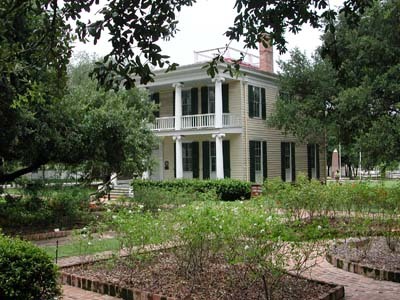 The Kellum-Noble House, the original restoration project for the Heritage Society, is probably the oldest surviving brick home in Houston. Nathaniel Kellum built the house in 1847 and sold it to the Noble family in 1850. Mrs. Noble operated her private school there until 1877, when it became part of the brand-new Houston Public School System. 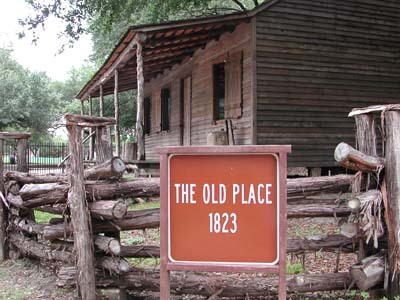 The Old Place is a rustic cabin built of rough-sawn cedar planks about 1823. It was moved to Sam Houston Park in 1973. 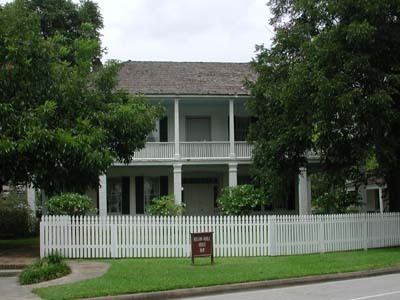 The Fourth Ward Cottage was moved from Freedman's Town to Sam Houston Park in 2002. It may predate 1858, and was built in a style suggestive of architectural ties to Acadian Louisiana. The Nichols-Rice-Cherry House was built in 1859 in the Greek Revival style, and was home to several affluent families through the years. It was the first house moved to the park by the Heritage Society after being saved from demolition in 1959. 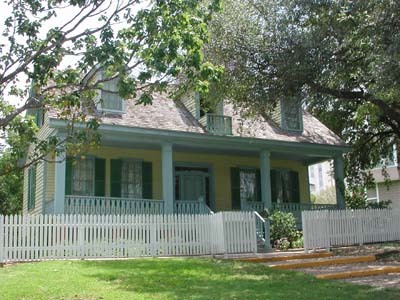 The San Felipe Cottage was built on the southwestern edge of Houston by a German immigrant family in 1868. Its six tidy rooms reflect middle-class life in the latter half of the Nineteenth Century. It was moved to Sam Houston Park in 1962. The Pillot House was built in a charming Victorian style in 1868, and belonged to the same family until 1964, when it was turned over to the Heritage Society. 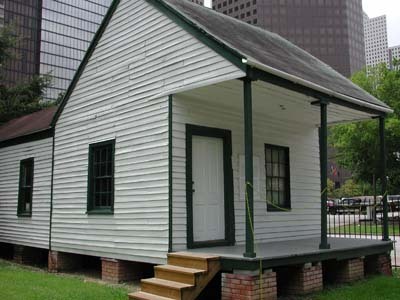 It is believed to be the first house in Houston built with an attached kitchen. 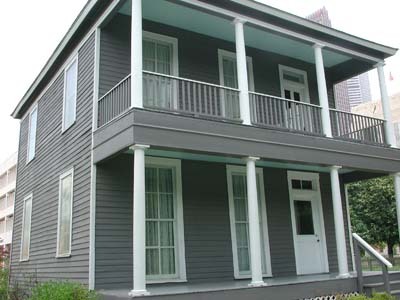 The Yates House exemplifies expanding opportunities for freed slaves after the Civil War. 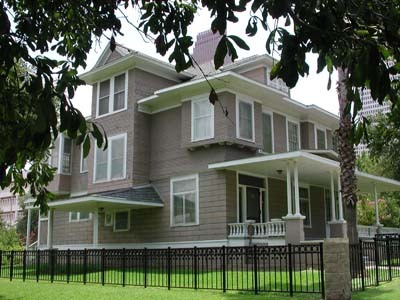 Roomy and comfortable, it was built in 1870 by Jack Yates, after whom a well-known Houston high school is named. Also moved from Freedman's Town, it stands in marked contrast to the tiny Fourth Ward Cottage. The Staiti House was built in 1905 with an amazing new convenience, electrical wiring. It is a fine example of turn of the Twentieth Century luxury. St. John Church was built in 1891 to house an Evangelical congregation that conducted services in German until well into the Twentieth Century. Given to the Heritage Society in 1968, it boasts its original altar, pulpit, and pews. Sam Houston Park opens up around these well-preserved monuments to past lives with a green expanse that invites modern-day visitors to take the air, toss a ball, and have a picnic. A lovely bandstand adds to its anachronistic charm, and a statue contemplates its reflection in a lily pond. On an adjacent block, at the corner of Bagby and Lamar Streets, the Heritage Society maintains the free-of-charge Museum of Texas History. Exhibits cover many aspects of life during past eras in Houston. Of particular interest is the Duncan General Store, a replica of an actual Nineteenth-Century store once located in nearby Wharton County. 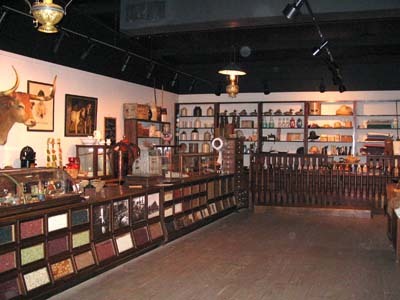 Most of the items exhibited were part of the original inventory of the store. The park and the museum are open to the public, but tours of the historic buildings must be arranged through the Heritage Society. For information on hours and fees, call 713.655.1912 or e-mail emartin@heritagesociety.org. 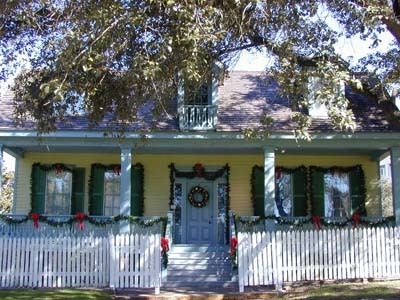 A Christmas tradition in Sam Houston Park is the annual Candlelight Tour in the Park. Re-enactors in traditional costumes conduct tours of the homes, which are decorated for the holidays according to the tastes of their eras and the means of the families that once lived in them. 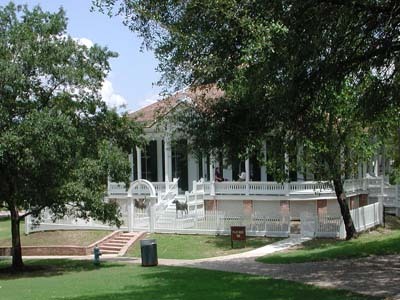 The Heritage Society also operates the Tea Room and the John B. Connally Plaza, which are available for memorable group events. Contact the Heritage Society at 713.655.1912 for booking information and Candlelight Tour dates. Thanks to the members of the Heritage Society for their ongoing dedication to preserving the history of our diverse community for the education and enjoyment of present and future populations. They have created a special place in the heart of Houston.